This is a classic Mediterranean dish and everyone has a way to do it– as is clear from the comments left after yesterday’s Wordless Blog. 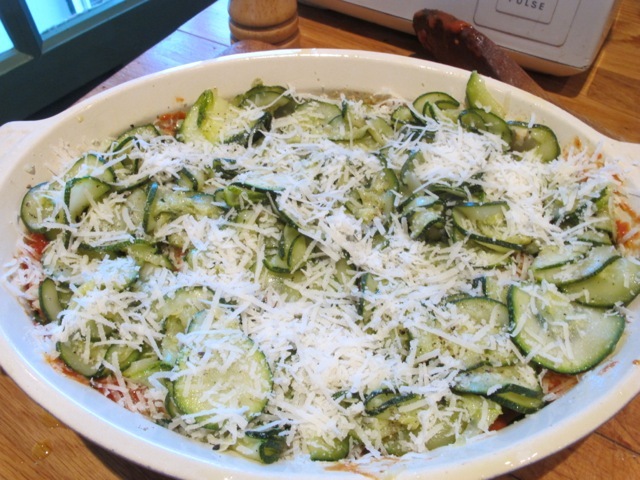 (I want to try a courgette parmegiagno this week–where the courgettes/zucchini are griddled as aubergines/eggplants are in the classic dish and then as here mixed with tomato and cheese). 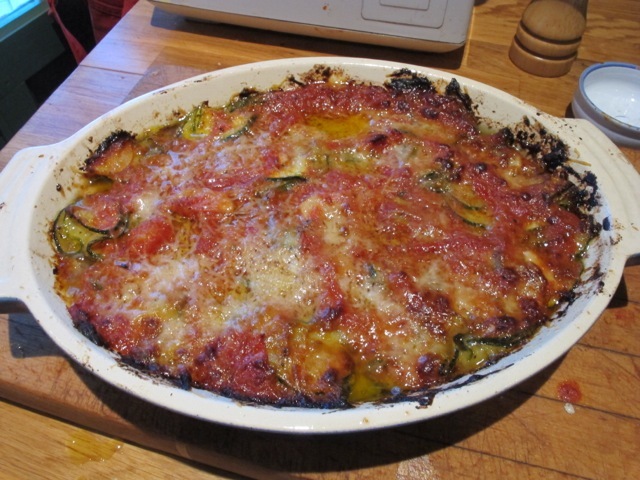 Italian style because it’s inspired by a Marcella Hazan version and is a little different to the Elizabeth David’s French gratin in Delicious Dishes for Diabetics. 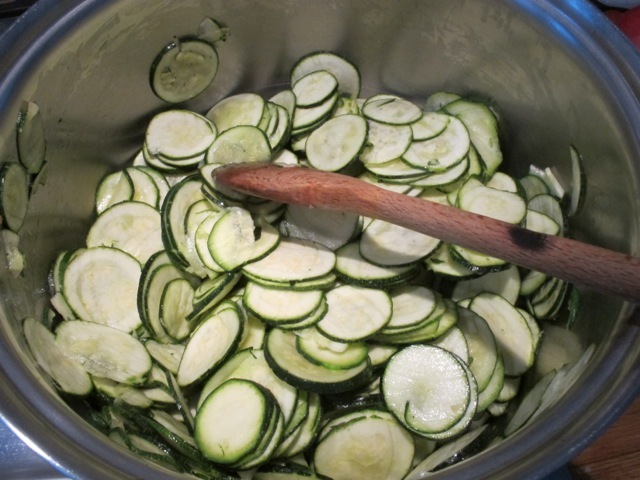 Prepare 3 good size courgettes/zucchini—top and tail them and slice them thin–a food mixer appliance does this nicely. 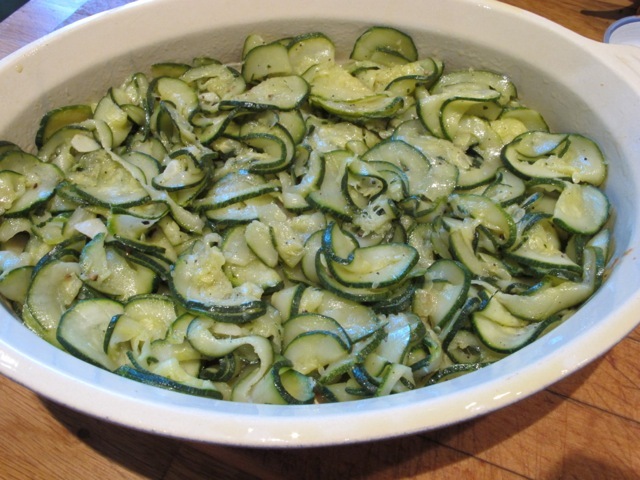 Heat a tablespoon of olive oil in a large saucepan and add the sliced courgettes, a chopped garlic clove and half a teaspoon of salt. Turn everything over several times to coat the vegetables lightly in the oil. Cook on a low heat until the courgettes are wilted. 1k/2lbs fresh tomatoes–cored and roughly chopped or 2 large tins of tomatoes–drained of their juice and roughly chopped. 2 garlic cloves–peeled and thinly sliced. Heat the oil in a large pan and add the garlic. Soften it briefly–being careful not to let it brown too much or burn. 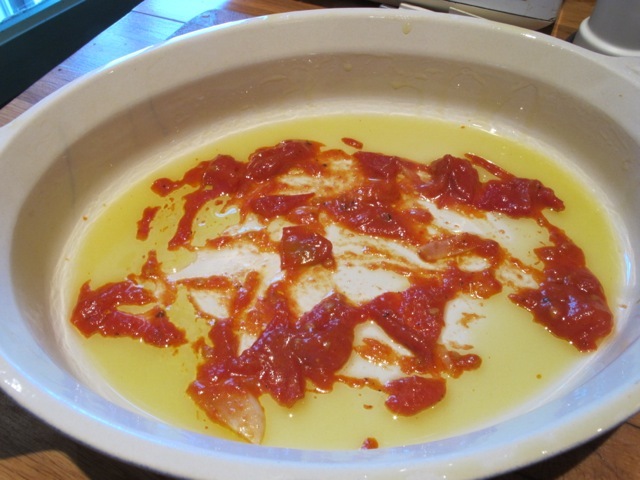 Add the tomatoes and cook over a high heat–stirring often–until the loose liquid has evaporated and little pock marks appear on the surface. If you can part the Red Sea—running a spoon through it–it’s done. Season with salt and pepper and stir in the basil. Grate 3 to 4 tablespoons (about 40gms) parmesan cheese. Heat the oven to 200C/450F. 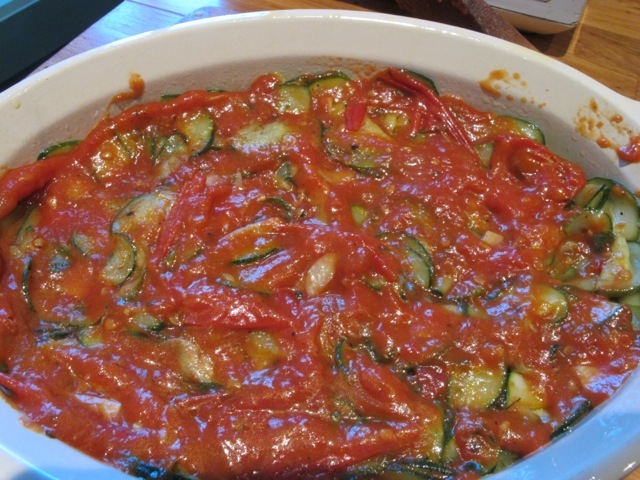 Smear the base of an oven proof baking dish of suitable size with some of the tomato sauce. Then cover this with a layer of courgettes/zucchini. Season lightly with salt and pepper and sprinkle a layer of parmesan. 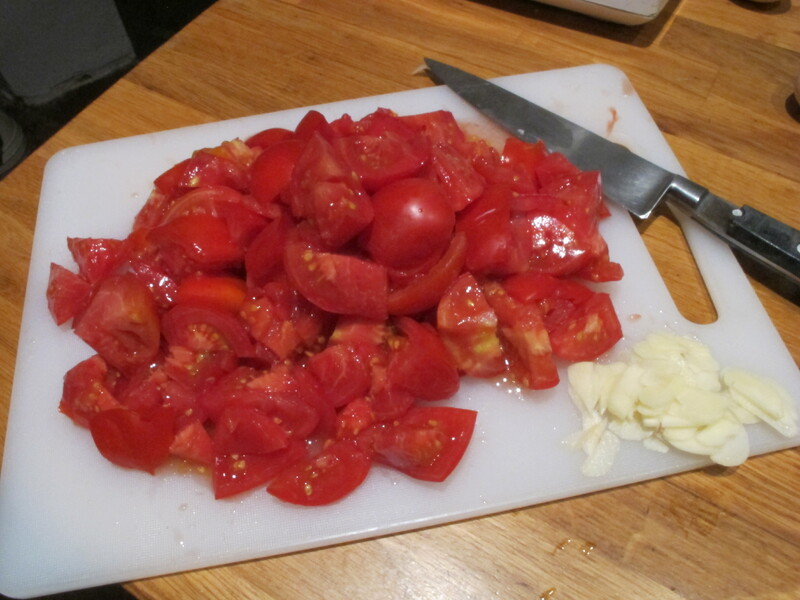 And repeat the layering, starting with a layer of tomatoes. Topping it off with the last of the parmesan. Put the dish high in the oven for about 20 minutes or until it displays an inviting crispy brown top. Can’t believe I have everything I need in the garden/kitchen for this dish! Except I will have to use Summer Squash instead of Zucchini. Came home to the kitchen counter covered in huge tomatoes (1lb each tom) yesterday, so this will be perfect, thank you. I collected 2lbs of toms this morning. Ask Meredith. It is like yellow zucchini. Mine is cooking as I type! I griddled the courgettes, only because I like them this way. What a lovely dish! I can see all sorts of possibilities. A bit of added onions and mushrooms would certainly work nicely. Great job in taking simple, in-season vegetables and turning them into heavenly perfection. Thanks Robin. I threw in some chopped onions too. And some mozzarella mixed with the parm. About to dish up now….. Elegant, yet so easy! That;s what I’m going for! Thanks! Courgette sounds so delicate and French! Staying with friends years ago who grew their own veggies, I cooked up an American monster that they urged me to cut down, as it was hanging over their bluestone wall — about 2.5 feet long!. Sliced with parm & olive oil, chopped garlic, then crisped the top. It was just fabulous. Can’t wait to try this recipe, tho, and the eggplant. 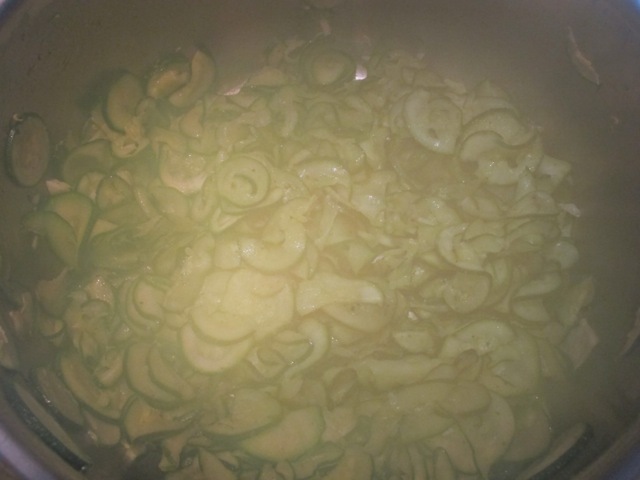 on September 11, 2012 at 6:56 am | Reply Caroline P.
I was looking for the blog in which you show me the thin sliced courgette. Yesterday I tried this thin sliced in stead of chopped courgette in my couscous and the whole family thought it was much better, so thanks for this simple idea. I wish you all the best with the skin “trouble”, medical things are frightening but I am sure there are good doctors in France.